What Do Healthcare Administrators and Hospital Administrators Do? As healthcare continues to experience unprecedented growth, leaders need to guide this ever-changing industry effectively in order to ensure that healthcare organizations operate at peak efficiency at all levels. Those with business management, interpersonal, and organizational skills may excel in a healthcare administration career–this role requires individuals to act as leaders and managers, guiding healthcare teams as they strive to provide proper care to those in need. Healthcare administration graduates work in fields ranging from hospital management to government. Some administrative positions, however, require an advanced degree and experience beyond an undergraduate degree, as well as additional training and/or certifications. When deciding on a position of interest, researching the job requirements is a must before applying. Organizations need leaders to plan and coordinate healthcare support services, especially for nonclinical positions. These managers typically supervise business upkeep and recordkeeping, and they also ensure that teams within the organization operate at top efficiency. According to the Bureau of Labor Statistics (BLS), estimates show that between 2016 and 2026, jobs in this field should grow about 10 percent. The median pay for 2016 was $90,050, or $43.29 per hour. From managing local nursing homes to overseeing comprehensive franchise facilities, nursing home managers are responsible for guaranteeing that patients’ needs are met and all operations run smoothly. The median annual wage for a nursing home administrator was $96,540 in 2016, and job growth is expected to remain much higher than average through 2026 at 20 percent. These leaders coordinate all medical and health services, and their responsibilities could range from managing an entire healthcare facility to specific clinical departments, like a cancer surgery center or outpatient facility. The median annual wage for a medical and health services manager was $96,540 in 2016, and job growth is expected to remain much higher than average through 2026 at 20 percent. Hospitals need administrators to create policies and ensure all staff follow them, as compliance with federal and state healthcare laws is necessary to keep the doors open. Hospital administrators also plan and coordinate operational activities. According to the BLS, such executive positions paid $103,950 in 2016, and job growth is expected to remain on par with the country’s average at eight percent until 2026. Healthcare marketers create advertising campaigns, write articles, and plan events for healthcare organizations of all sizes, ranging from nursing facilities to large, multi-state hospital systems. The median annual wage for a healthcare marketing manager was $127,560 in 2016, and job growth is expected to remain much higher than average through 2026 at 10 percent. Underwriters wield exceptional power, as they decide whether to provide insurance to individuals and under what terms. They study insurance applications and decide what coverage to provide and what to charge for premiums and deductibles. According to the BLS, such positions paid $67,680 in 2016, and job growth is expected to decline by five percent through 2026. For those with a passion for understanding how governments operate, political scientists research political ideas, trends, and laws. According to the BLS, such positions paid $114,290 in 2016, and jobs are expected to grow at three percent through 2026. Filling hospitals with skilled nurses, physicians, and support staff is essential to running a successful healthcare organization. Recruiters hold this responsibility, and they must screen, interview, and hire the most qualified candidates. Employment of healthcare recruiters is projected to grow seven percent from 2016 to 2026, and median pay for 2016 was $59,180. Professionals interested in pursuing a health administration career should consider enrolling in a master’s degree in healthcare administration program. 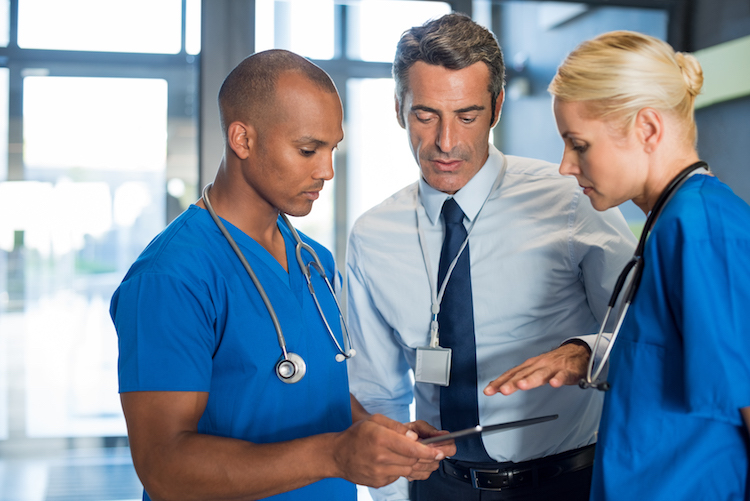 A graduate healthcare administration degree can help students learn the tactical and strategic planning skills needed to potentially augment a healthcare organization’s operations. Now that you have an idea of the types of careers MHA graduates often pursue, you may be interested in learning about an MHA program that can provide students with the foundational skills and knowledge necessary to potentially excel in such occupations. Learn more about Maryville University’s online master’s in health administration degree program here. Still unsure whether a healthcare administration program is right for you? Take a look at this breakdown of the differences between MPA and MHA degrees for further insight.